VyC is committed to creating and sustaining a statewide, consumer-driven approach to promoting the health and well-being of Latinos/as and their families by supporting Promotores, leaders, community health workers and others who serve the community in ways consistent with the values and scope of practice of the Promotor model. Created by promotores, VyC represents the collective voice of Promotores and responds to the ideas, needs and priorities they identify in their communities. 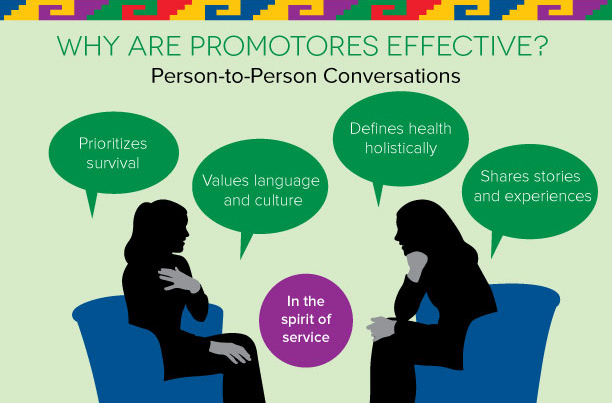 Today, the National Network of Promotores and Community Health Workers reflects VyC’s participatory and consensus building strategy and commitment to popular education methodology. By investing in Promotores as leaders of change, VyC strengthens their collective voice and increases their ability to advocate for policies and practices to improve individual and family well-being and create lasting community change. Partner with key advocacy organizations in California and across the U.S.
receive health information and referrals from 4,000 VyC promotores.